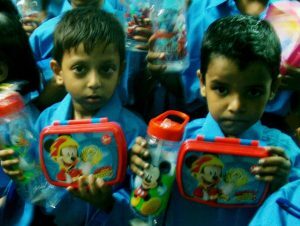 Children attending the CRS Education Centre at Topsia now have new uniforms, shoes and socks, wool cardigans for the winter, lunch boxes and water bottles thanks to funds raised by children at Ashgate Primary School in Derby. The school room will also be equipped with a ceiling fan and shoe rack. This follows the visit of two teachers from Ashgate to Topsia earlier this year as part of the Derby Diocese partnership.